For its rather small size, Kimolos offers a generous choice of dining options serving Mediterranean classics and home cooked traditional meals. 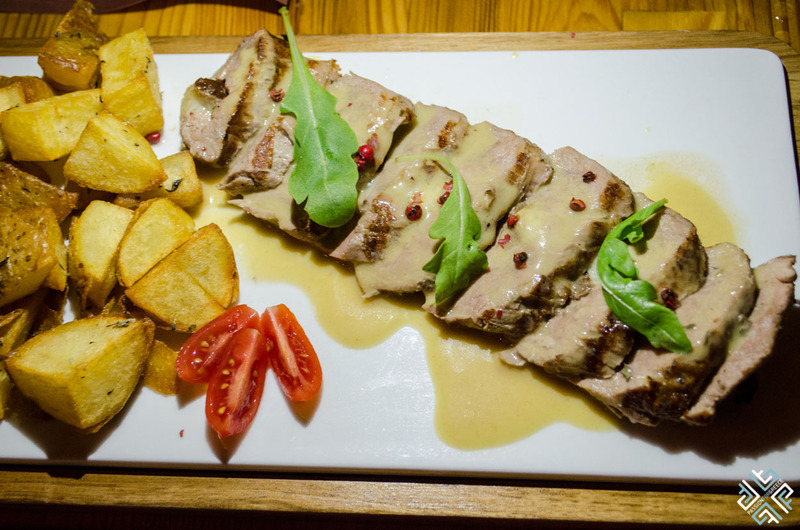 In an unpretentious setting you will try some fresh, insanely delicious dishes. 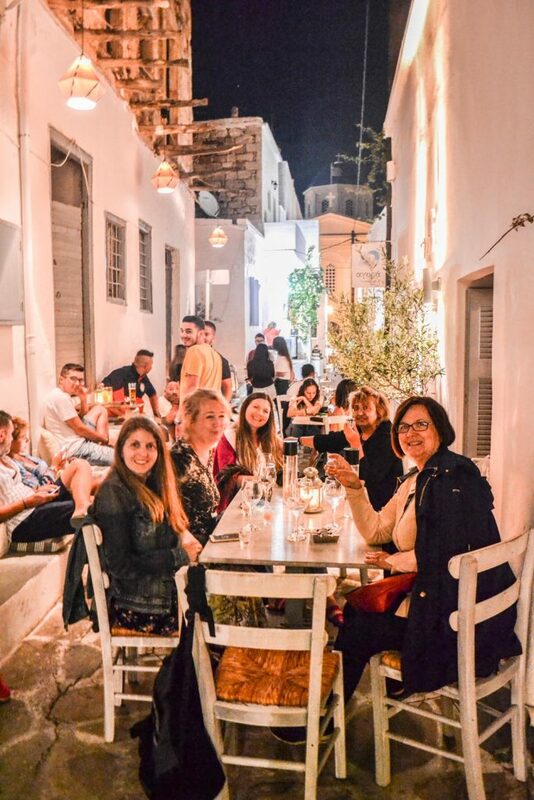 At Passion for Greece we take our dining seriously, therefore after having visited and tasted, we present you with some of the best restaurants on Kimolos. 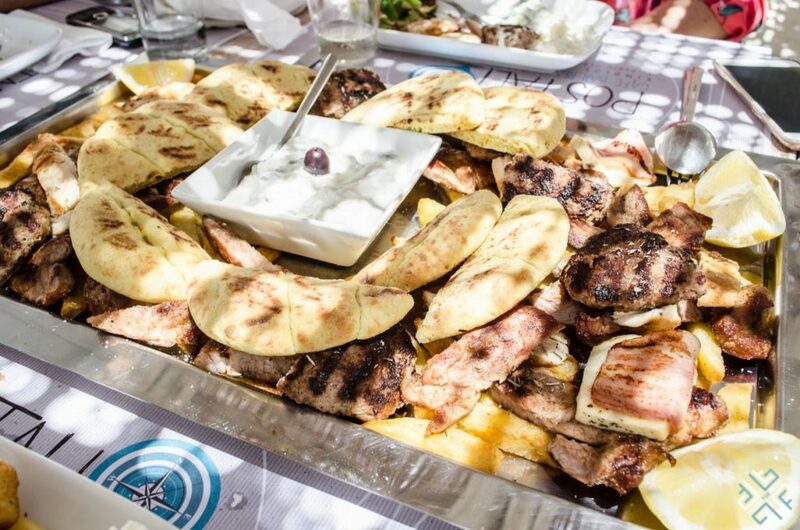 As you follow the road from Chorio all the way to the popular beach of Aliki, you will come across the famous Sardis Restaurant serving authentic Greek cuisine. 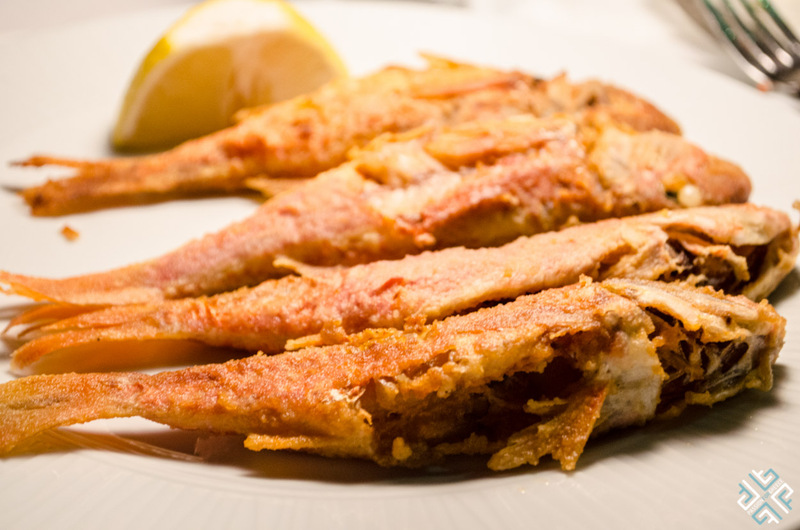 This family-run taverna and rooms to let was founded by Bemba who followed in her father’s steps, honouring the family tradition of supplying freshly caught fish to the restaurant. 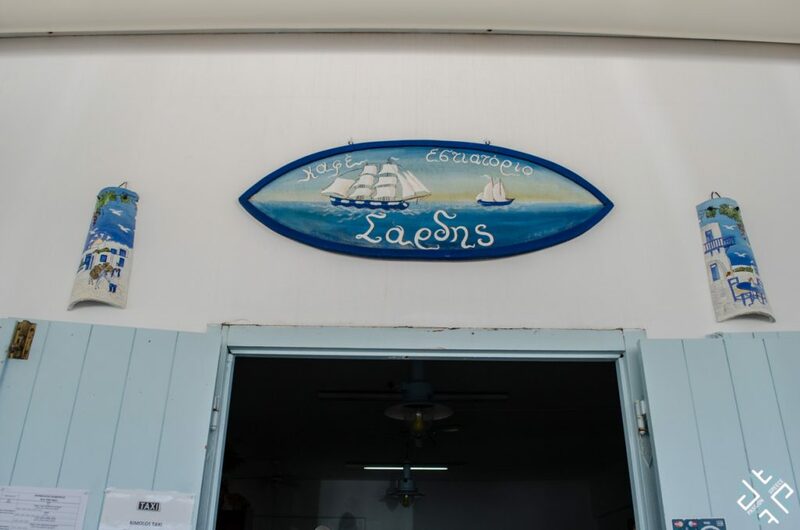 Bemba or the Queen of the Cyclades as she jokingly calls herself is in fact a brand name on the island of Kimolos. 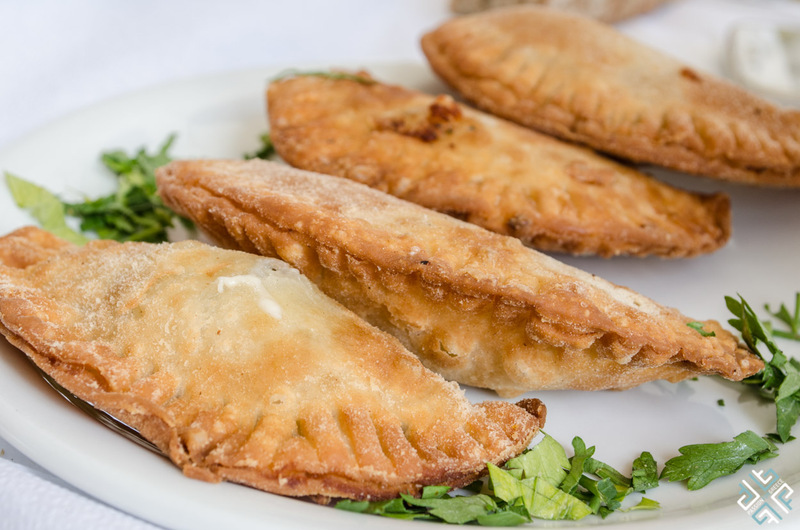 The family business began in 1992 with the construction of the rooms to let followed by the opening of the restaurant in 1995. With a great passion for cooking and for serving the best and freshest Greek cuisine, Bemba worked hard to establish her business. Eventually a few years ago, she passed her business onto her son Themis and his wife, who continue the family legacy with pride. 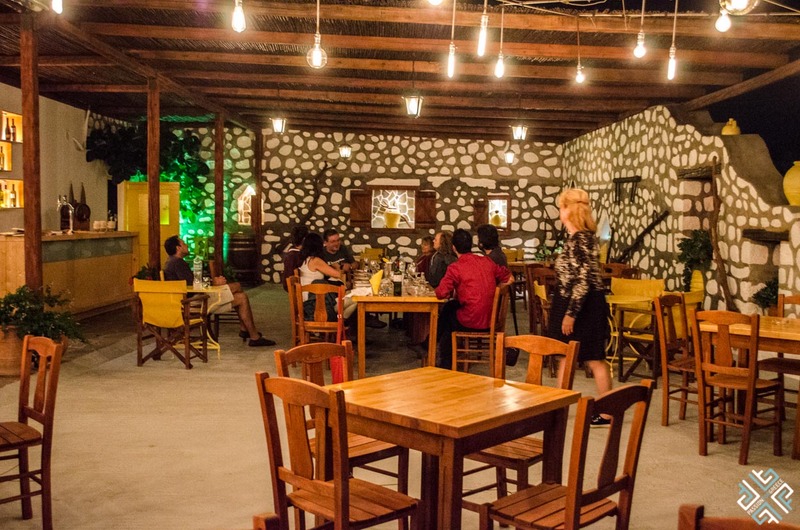 Of course Bemba is still at the restaurant overseeing that everything runs smoothly, but above all she is there to meet her returning guests who keep on coming back year after year. 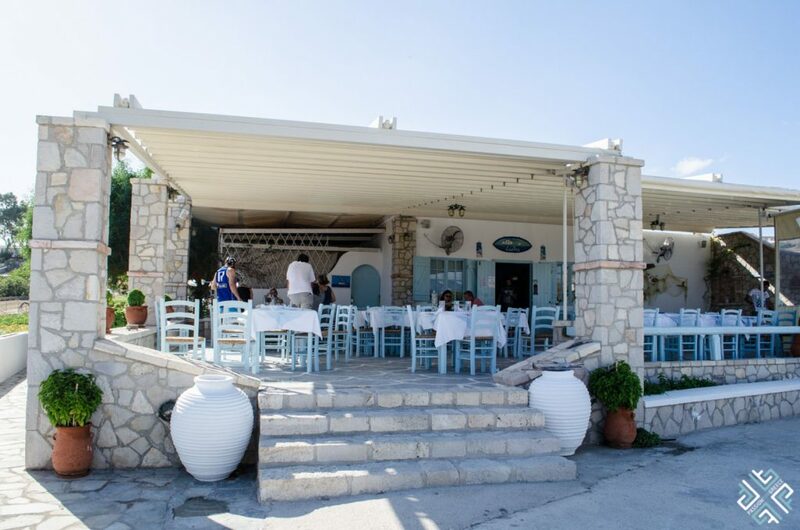 The look of the taverna is typical Greek island style, with a large covered outdoor veranda complemented by the light blue tables and chairs. 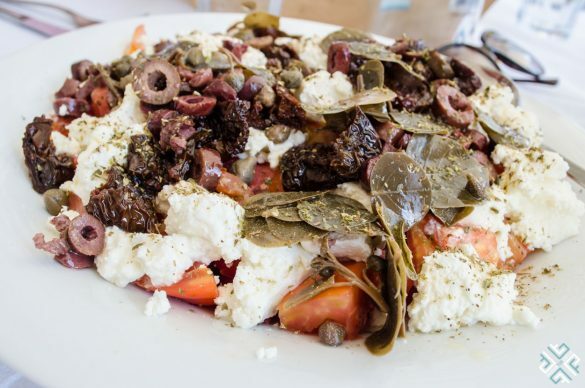 We tried a selection of hearty dishes starting off with refreshing salads like Mostra, a wonderful mix of fresh tomatoes, caper leaves, slices olives, sun-dried tomatoes and xino cheese (sour cream cheese from Kimolos). 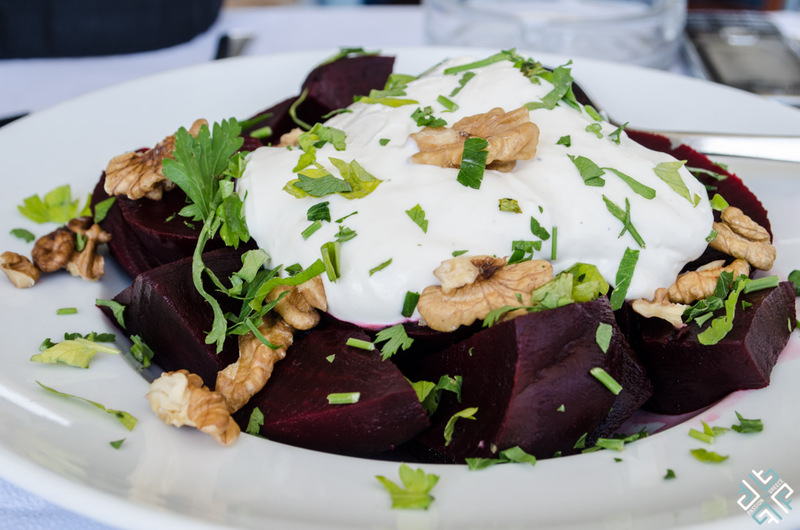 We also had a delightful beetroot salad mixed with yogurt and walnuts. 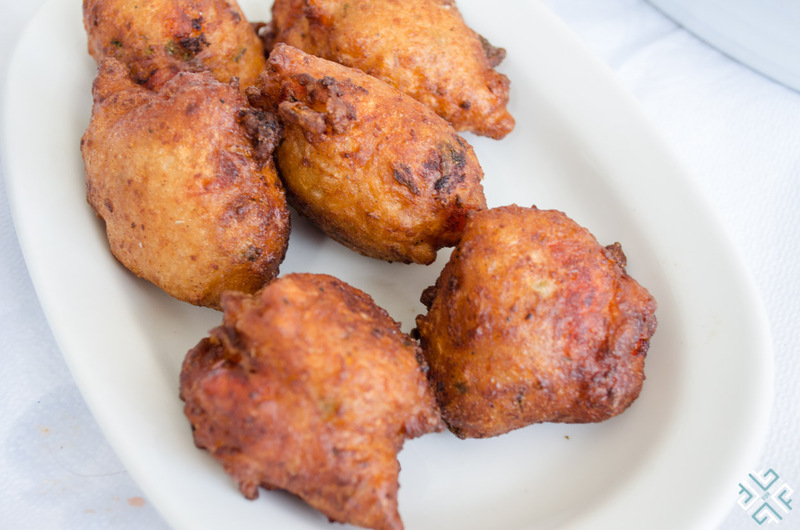 Make sure to try some of Bemba’s signature appetisers such as fried tomato balls and ladenia. 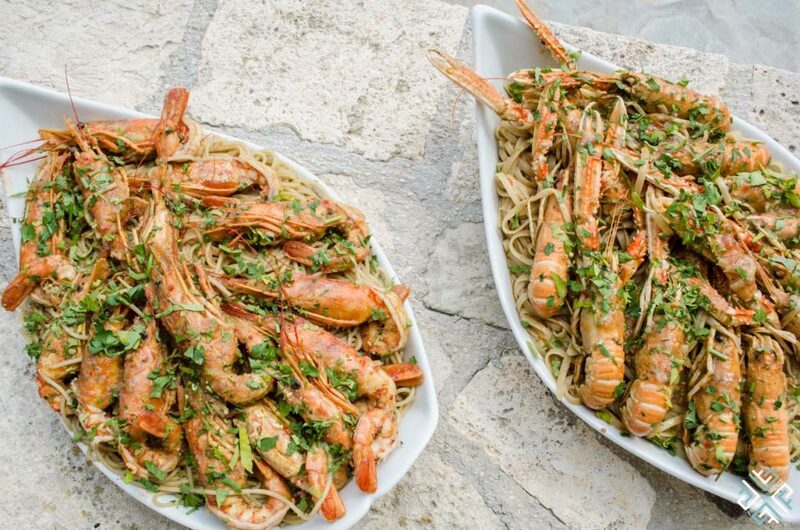 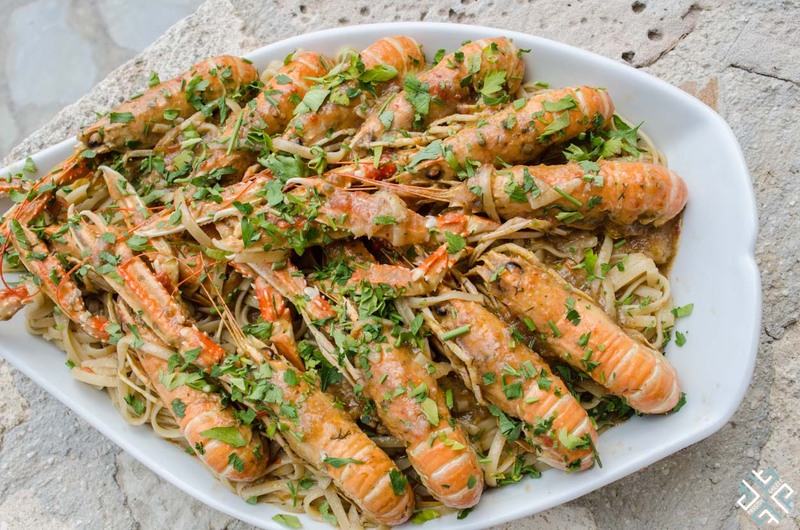 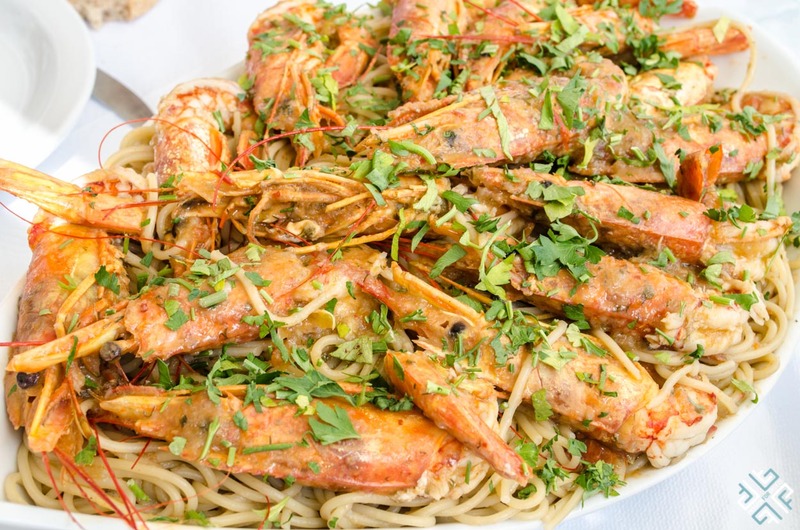 For a moment we travelled to seafood heaven, as Themis started bringing out large platters filled with freshly cooked shrimp spaghetti and crayfish linguine. 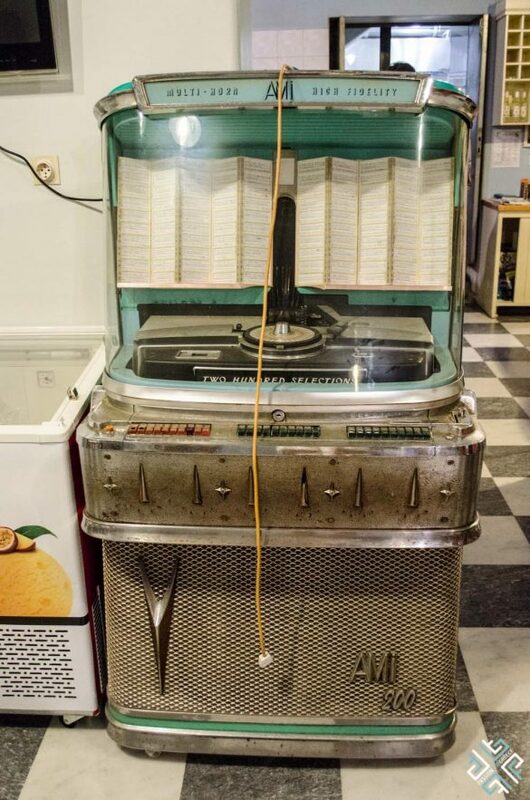 I believe that the photos speak for themselves. 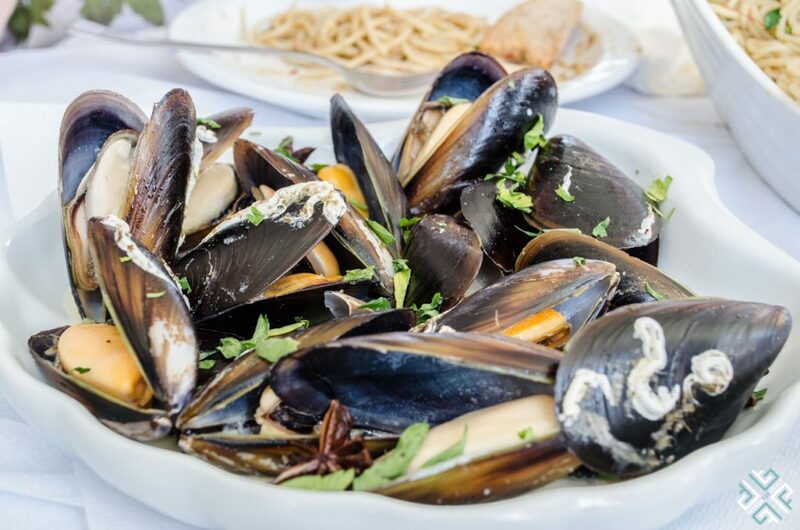 We also tried the mussels cooked in a fantastic ouzo sauce. 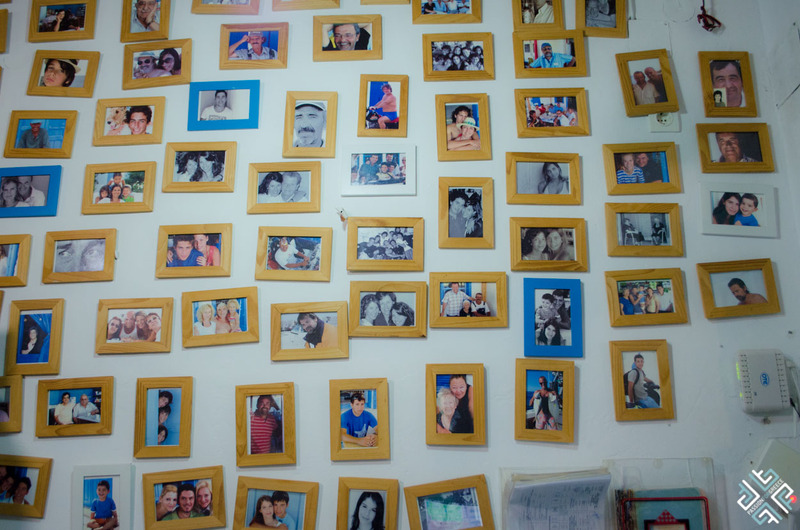 The goodhearted restaurant, yes this is how it’s called. 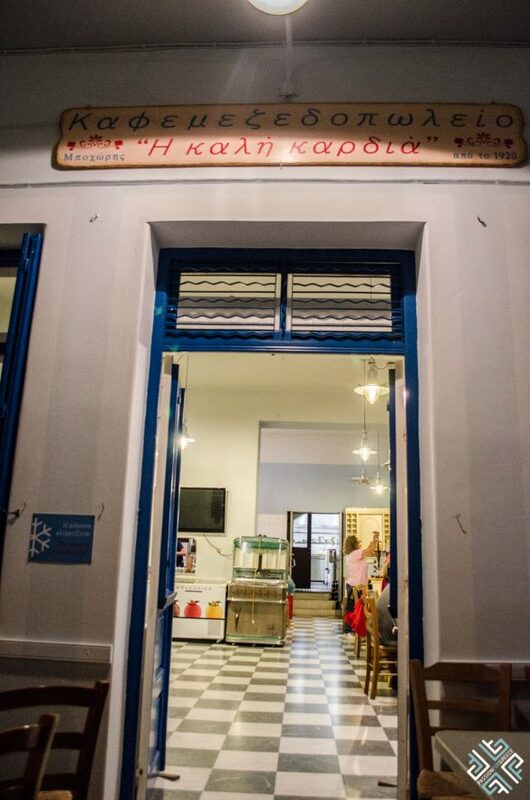 An all day traditional cafe — restaurant situated on the main street of Chorio has been around since 1920. As the lovely Mr Apostolis explained he continues the legacy of serving traditional Kimolian dishes based on his grandmother’s recipes. 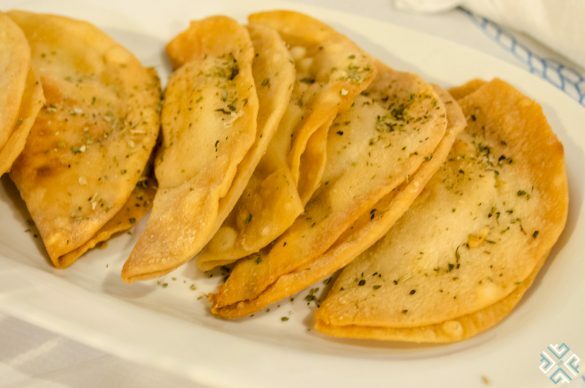 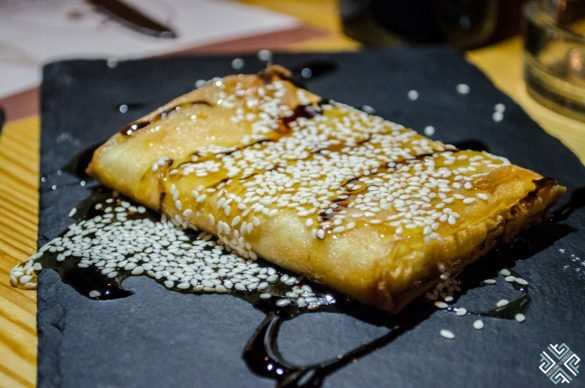 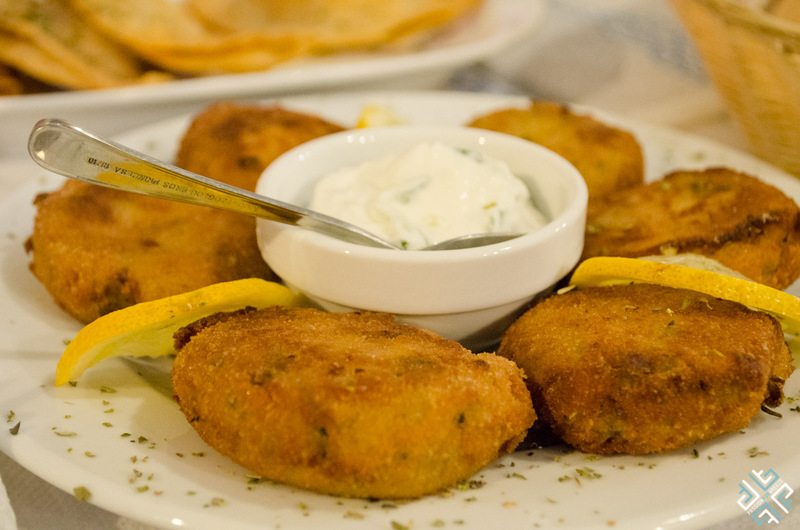 The highlights of the menu are the ladera — classic Greek dishes which are olive-oil based and most are vegetarian. 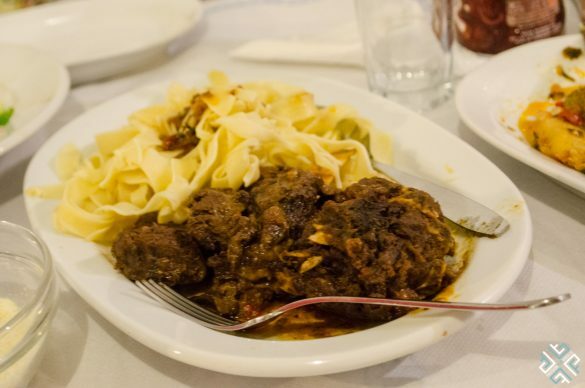 At Bohoris you can have them served with tender goat meat. Crete is known for its staple dish called gamopilafo — a special rice dish (risotto) cooked in goat broth. 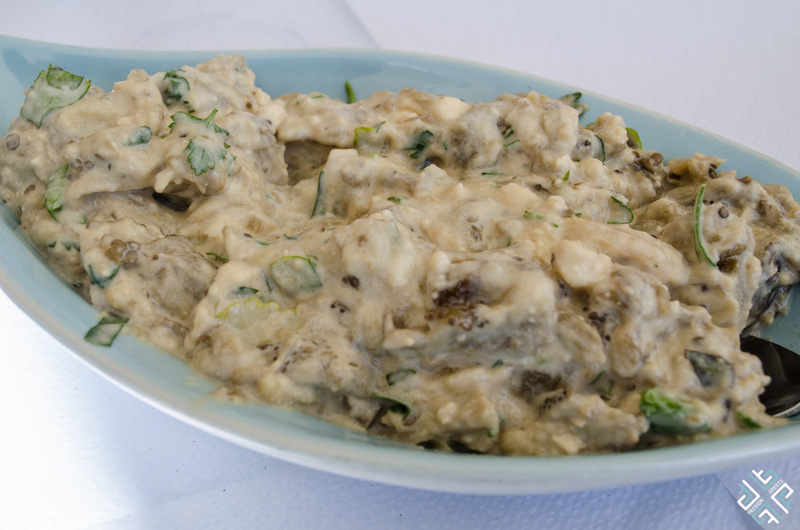 A typical Cretan Wedding dish which is now also served in many tavernas. 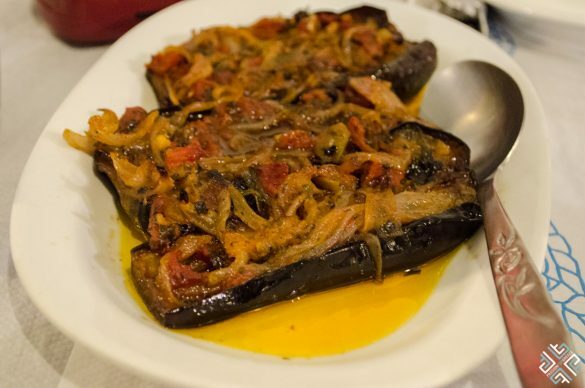 At Bohoris we tried the Kimolian version of gamopilafo which Mr Apostolis served us with hylopites, a Greek egg pasta. 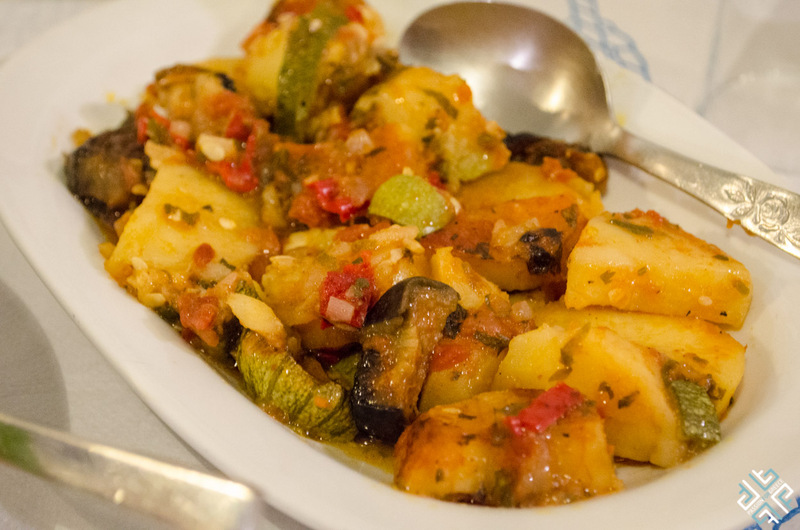 Some classic examples of ladera dishes which we had are: melitzanes (eggplants) cooked in a rich fresh tomato sauce, briam a mixed roasted vegetable dish usually made with zucchini, eggplants, potatoes, fresh tomatoes and plenty of olive oil. 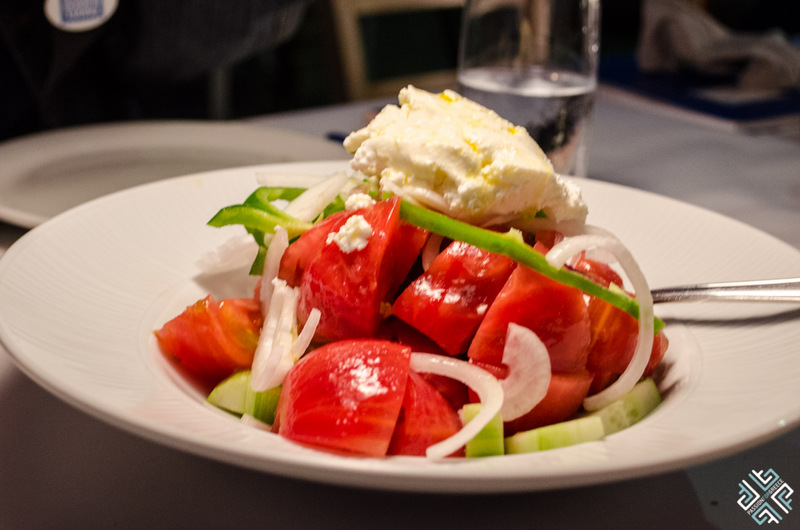 The Greek salad on Kimolos is usually served with the xino cheese rather than the classic feta cheese. 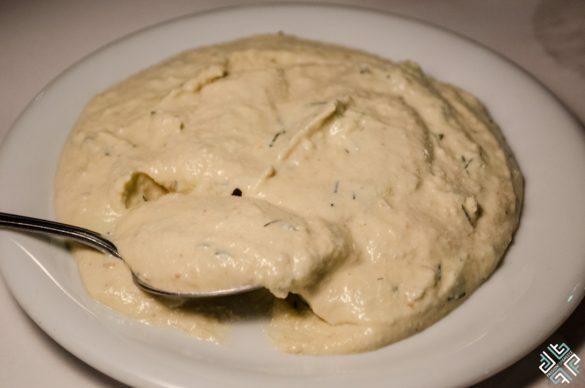 You can also order a separate portion of xino. 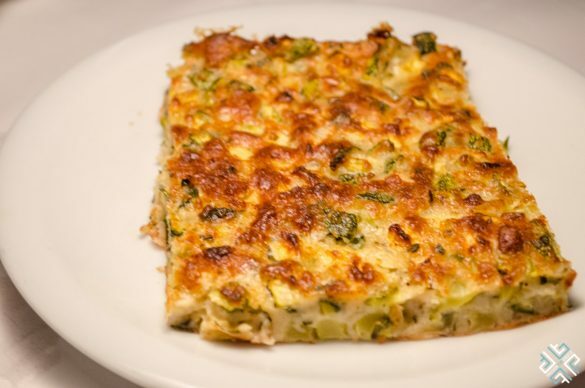 You must absolutely try the Moussaka, one of the best you will ever have – guaranteed. 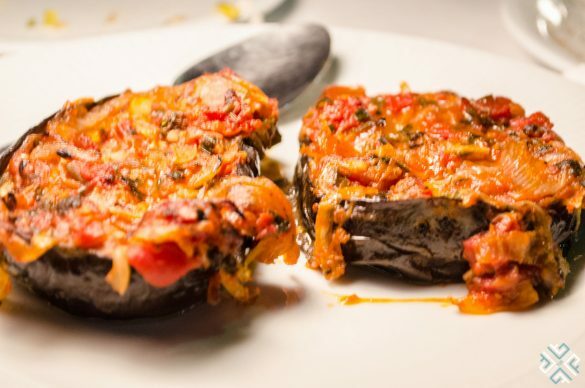 The sweet taste of the aubergines and the velvety béchamel sauce are an exact definition of perfection. 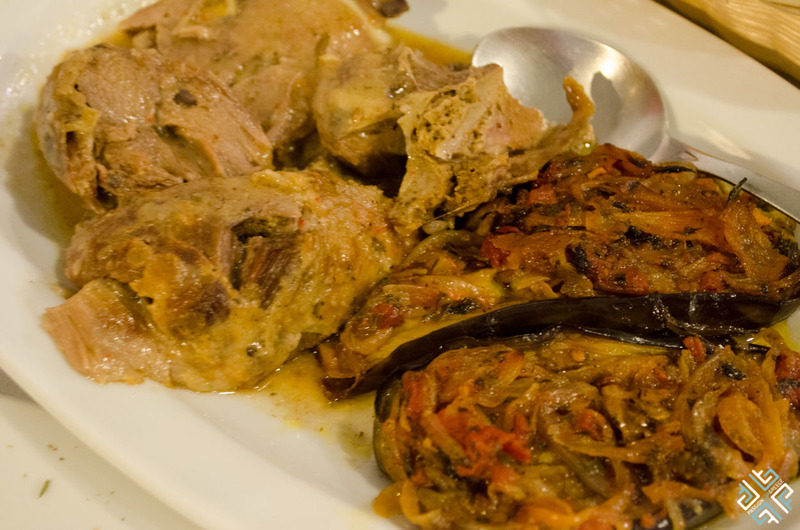 The menu features a selection of grilled meat dishes too. 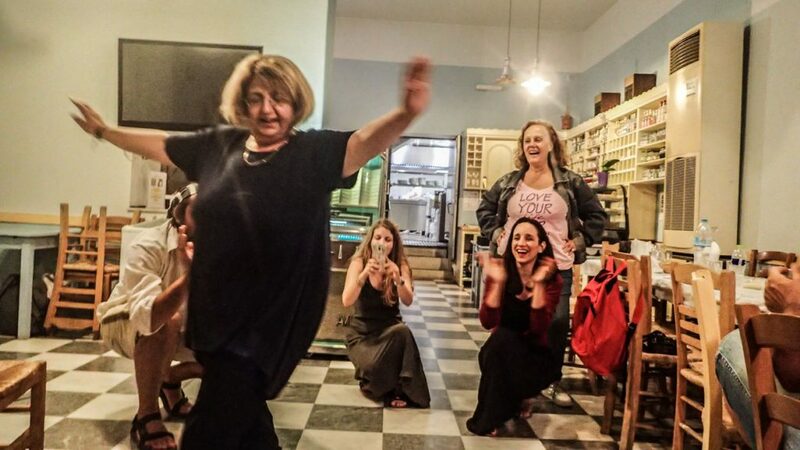 The cozy ambience and the sound of the jukebox, followed by some dancing, will gift you with experiencing an evening of traditional Greek feasting — exactly how it was done in the old days. 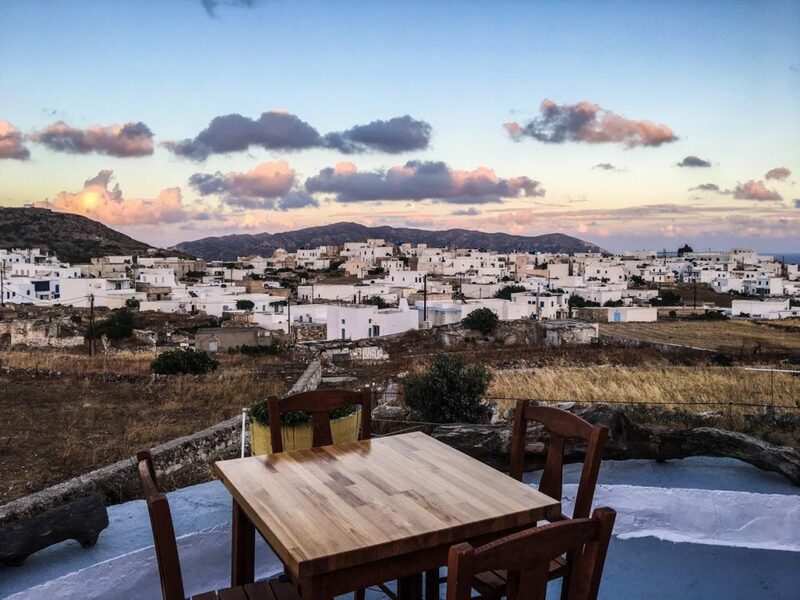 For a night of creative Kimolian cuisine head over to the Meltemi Restaurant, set inside the Chorio (opposite the Post Office) offering breathtaking views of the settlement, especially during sunset. 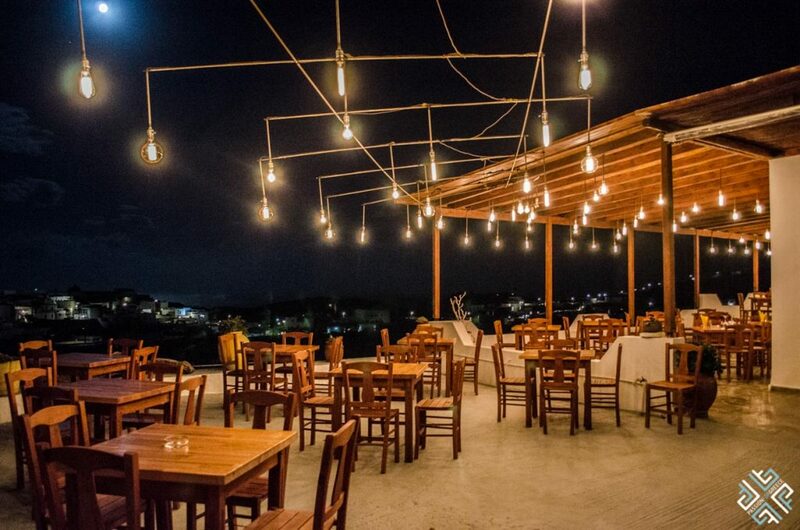 As soon as the night falls the whole restaurant is illuminated by the twinkling hanging lights which create a romantic setting. 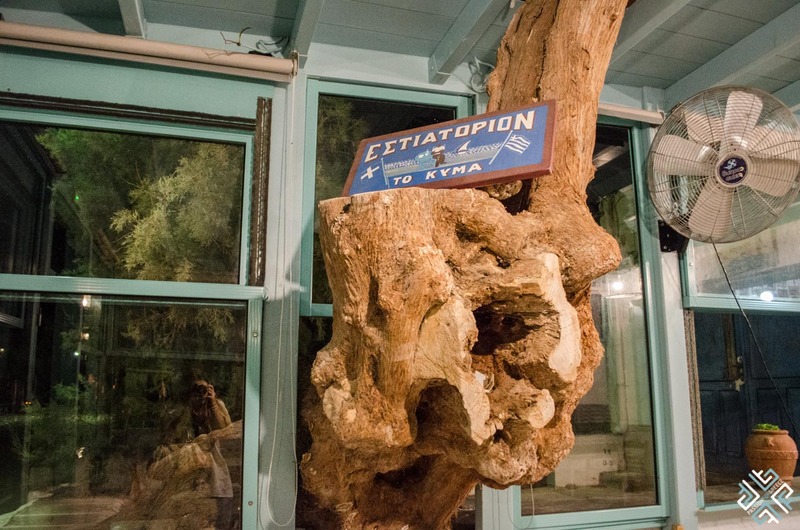 The space mixes wood panelling with stone walls and traditional farming tools such as ploughs used to decorate the restaurant exteriors — highlighting the island’s rich agricultural past. 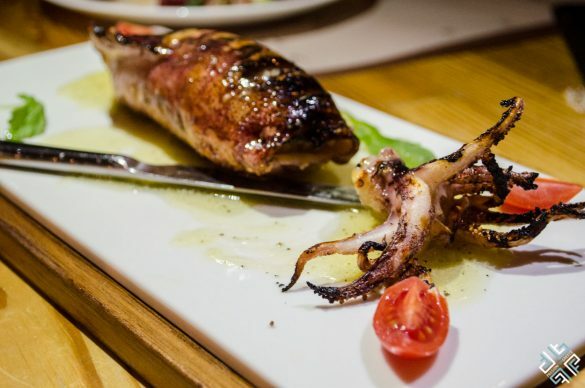 The renovated restaurant concept is managed by a young, talented chef Augoustos Galanos — who at the age of 24 has inherited the taverna from his parents and turned it in a modern culinary concept that touches upon the traditional Kimolian cuisine. 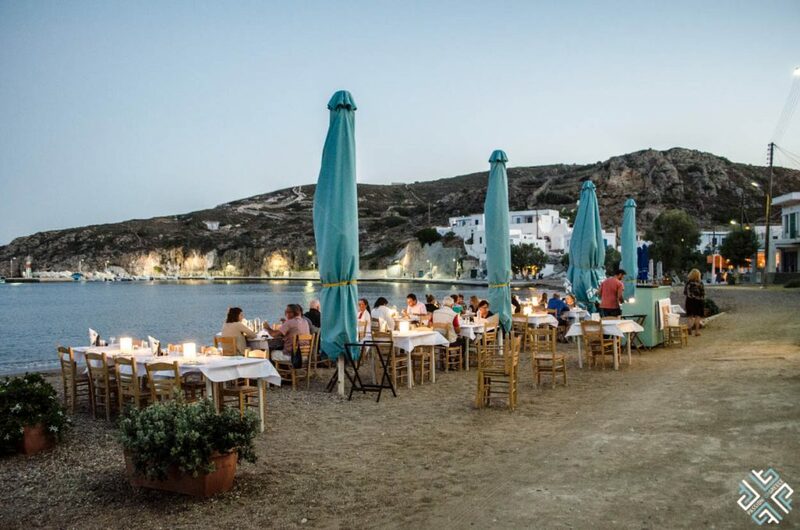 During the winter months, Augoustos works in Athens and in the summer he returns to his island to manage his restaurant, where he cooks and serves his outstanding dishes. The Meltemi is not only about good looks, the menu is vibrant and reliably tasty. 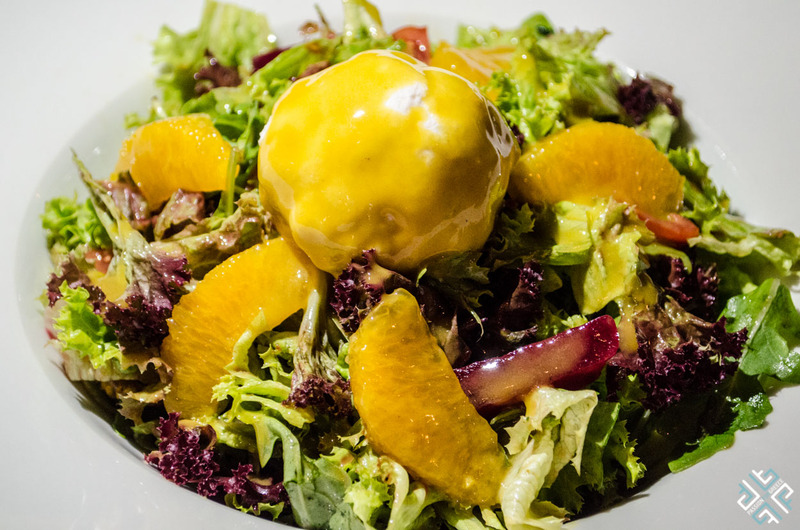 We indulged on fantastic salads — the Meltemi salad, a mix of greens topped with a zesty orange and xino cheese, tantalising your taste buds with a citrusy flavour. 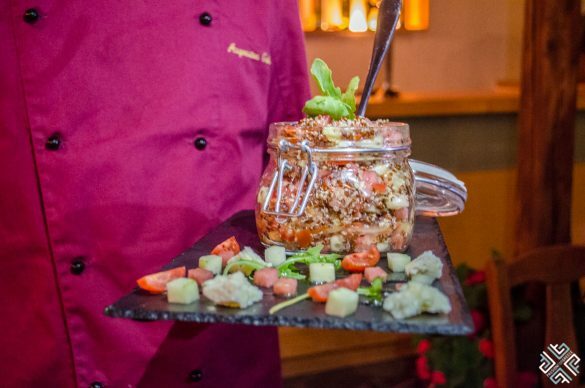 The Kimolos salad is a definite must-try, I just loved the explosion of flavours — watermelon, quinoa and cucumber. 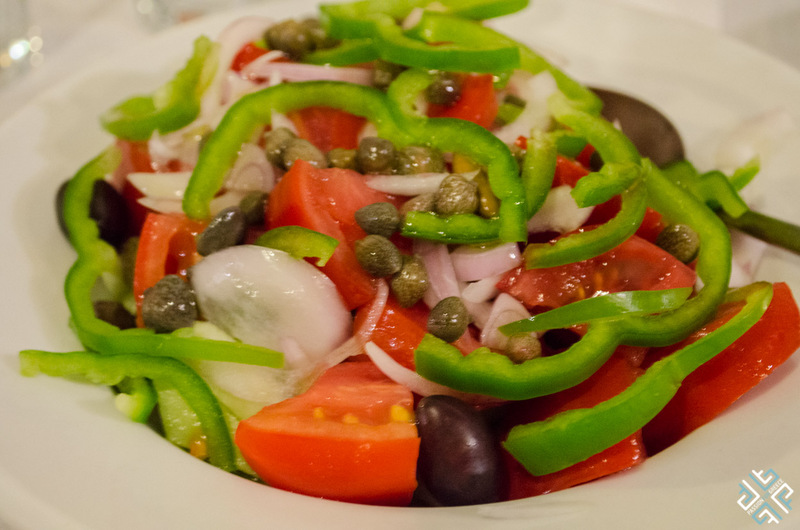 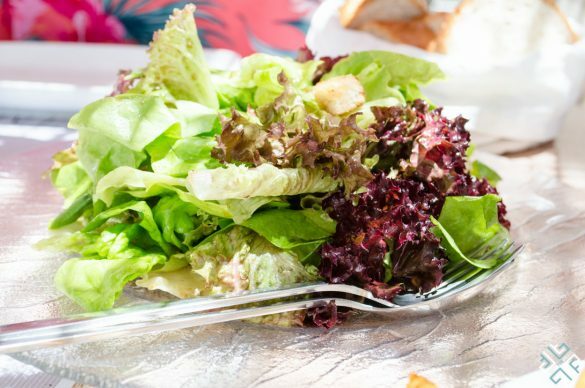 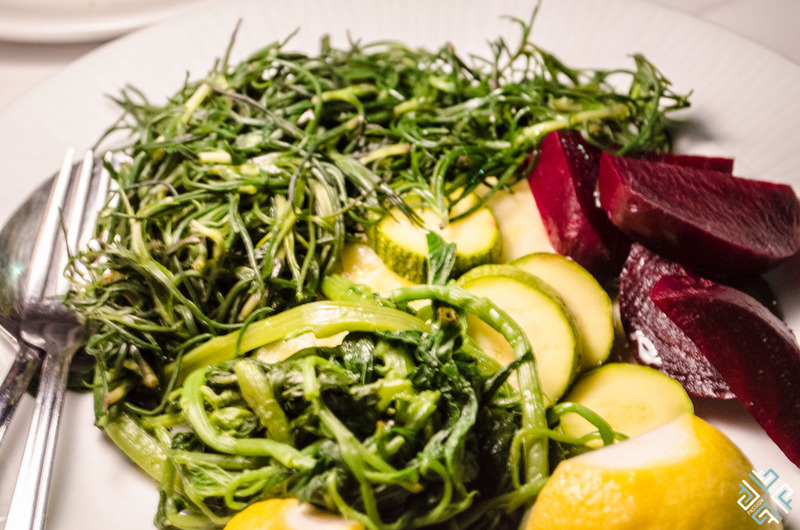 Perhaps it is the most refreshing salad served on the island. 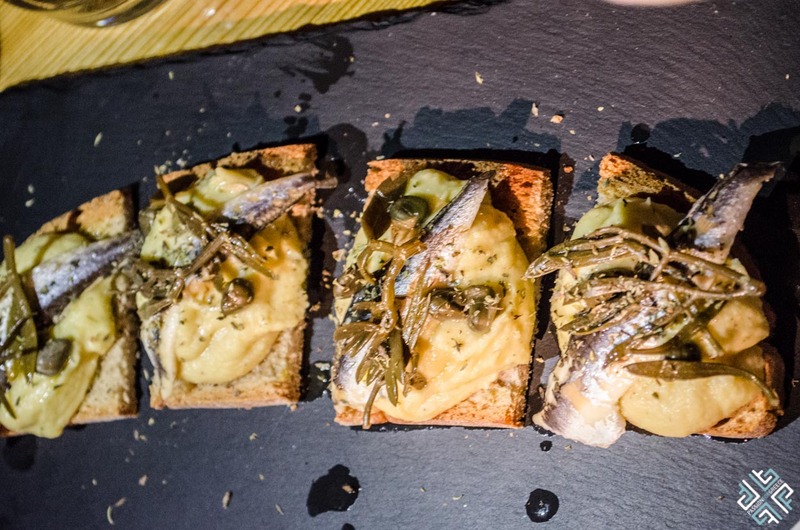 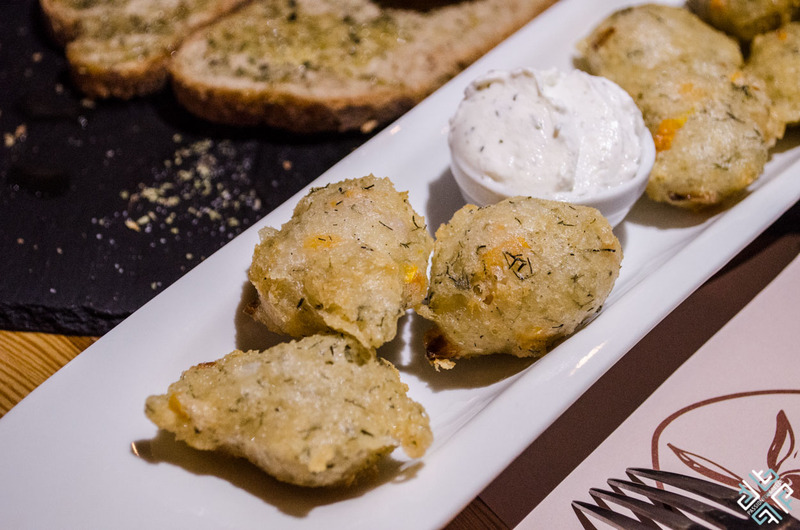 Other delicacies to try are the fried balls made of red squash, manouri cheese and fennel, the Gavros bruschetta, marinated anchovies served on fava beans dip and the grilled stuffed squid. 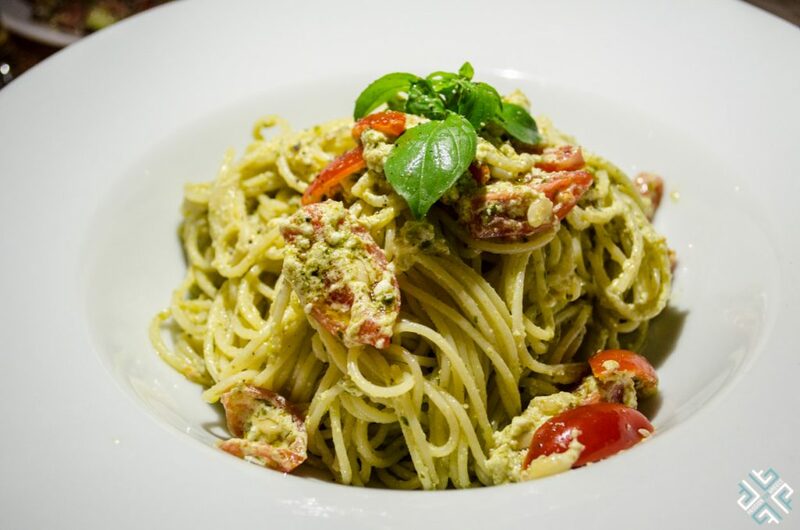 If you like pasta then you will love the pesto spaghetti cooked with fresh cherry tomatoes. For the main opt for the signature pork tenderloin dish served with roasted potatoes. 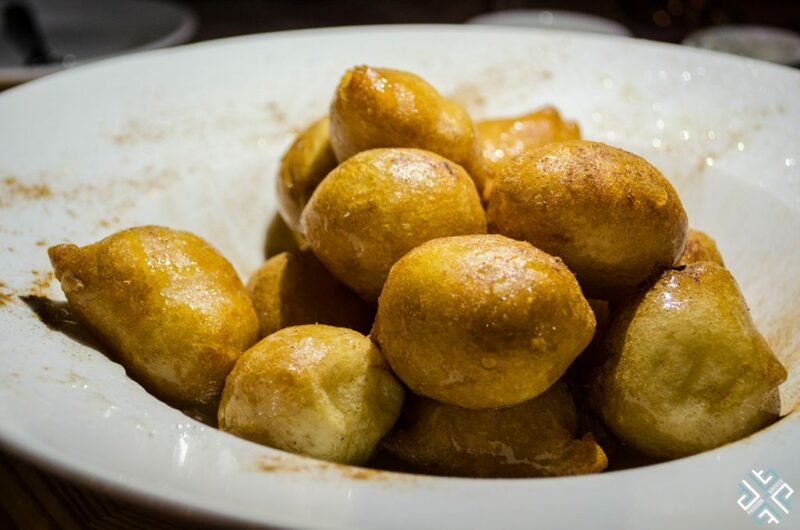 Make sure to leave some room for dessert and try the staple Greek sweet called loukoumades — fried dough balls dipped in honey. 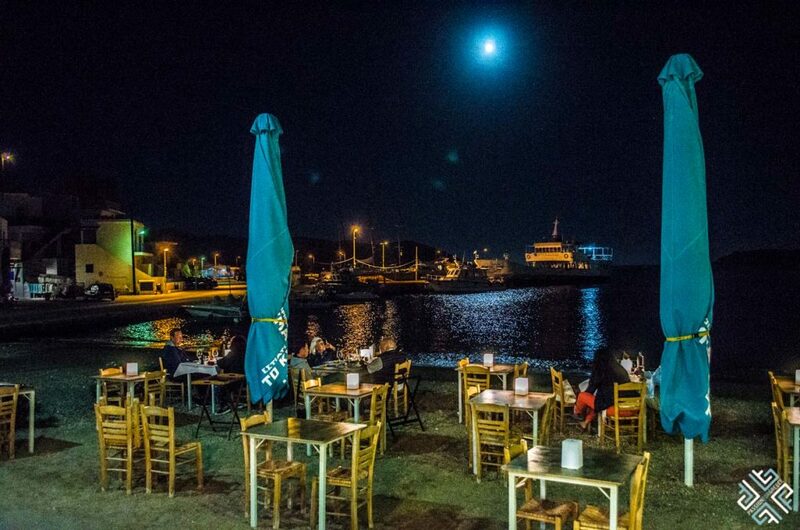 This seafront taverna is located right at the Port of Kimolos. 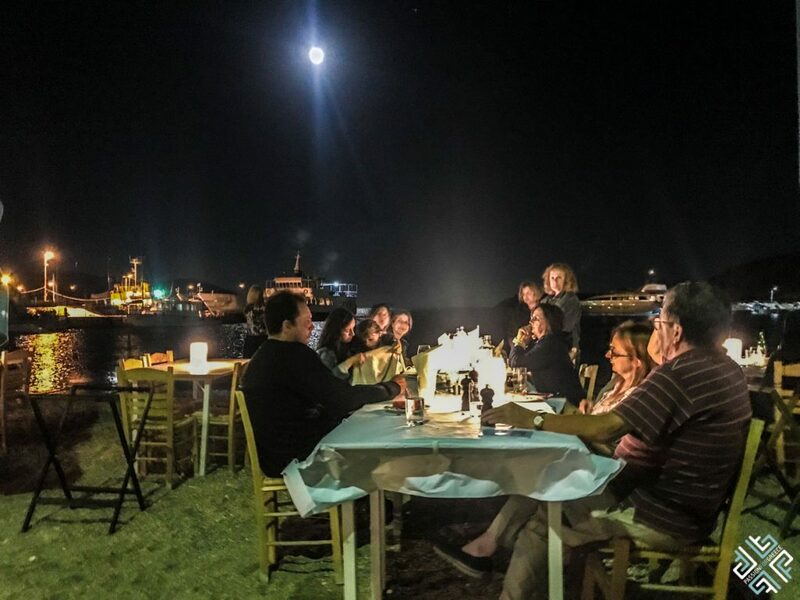 Under the moonlight, by the sea To Kyma translating as the wave offers romantic Greek taverna dining right on the beach. With our feet touching the sand and the gentle sea breeze caressing our faces, we enjoyed a selection of seafood dishes. 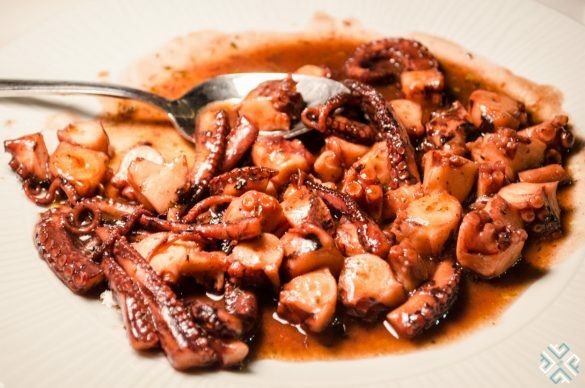 For starters we had the Greek salad with the xino cheese (typical of Kimolos), zucchini pie, taramasalata a famous dip made with salted and cured roe of the cod, bread, lemon juice and olive oil, melitzanes (eggplant dish), a selection of boiled wild greens (horta), delicious octopus cooked in a red wine sauce and fresh barbouni fish (red mullets). 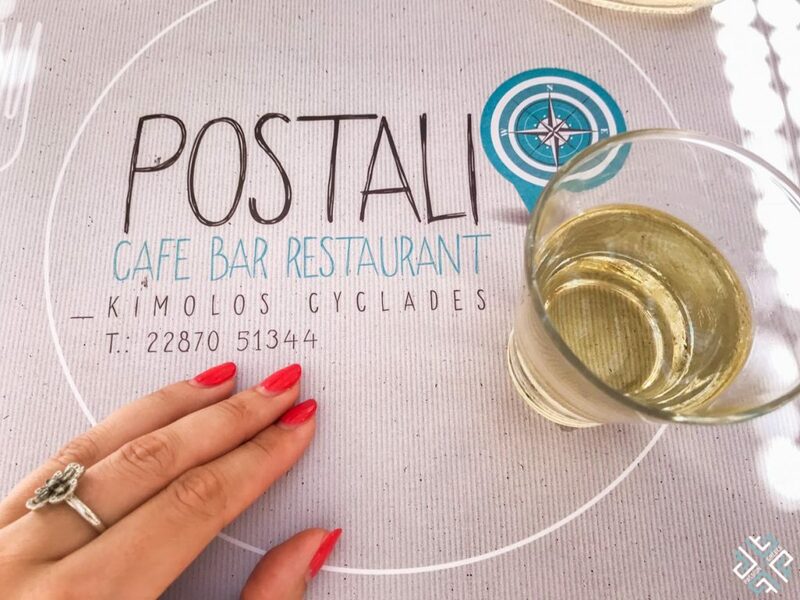 Located in the Port of Kimolos right across from where the ferries dock, Postali is a great all day venue serving a selection of salads, pasta dishes, sea food appetisers, as well as grilled meats. 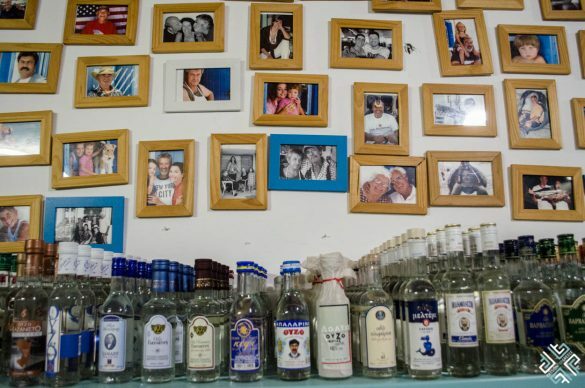 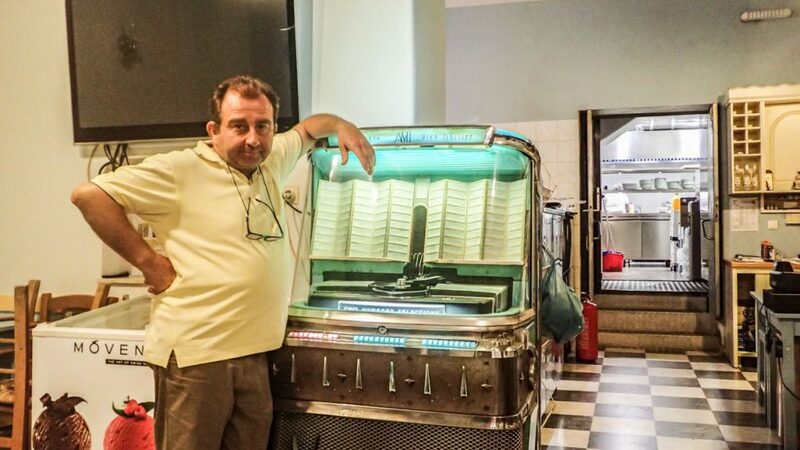 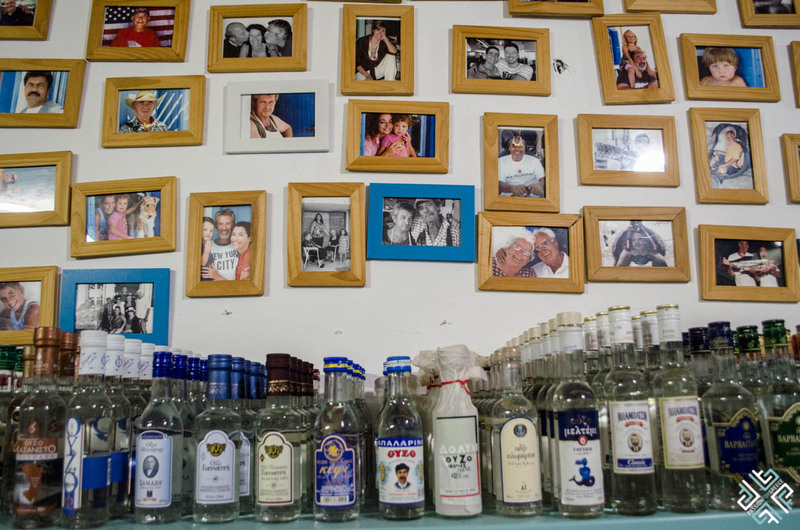 The Postali Cafe – Bar – Restaurant belongs to Mr Apostolis, the lovely gentleman who also owns Bohoris. 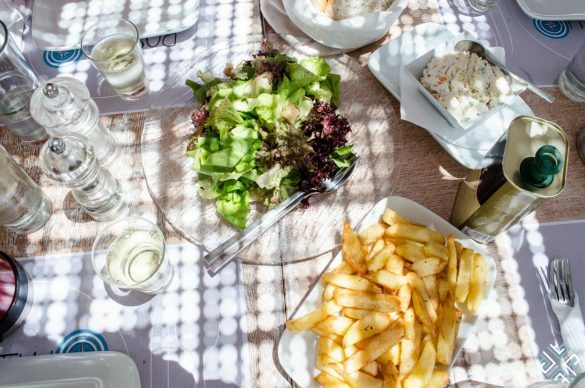 On our final day on Kimolos, just before departing for Athens we enjoyed a delightful lunch — we had a mixed green salad, xino cheese, tirokafteri which is a spicy cheese dip, fresh fries and a fantastic mixed grill platter. 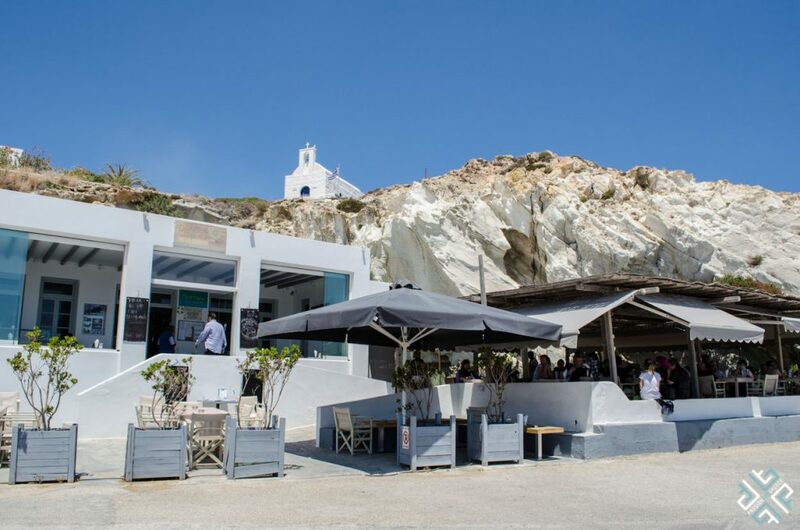 Right in the heart of Chorio, next to the walls of the Castle this Cocktail Bar is known for its exceptional drinks menu. 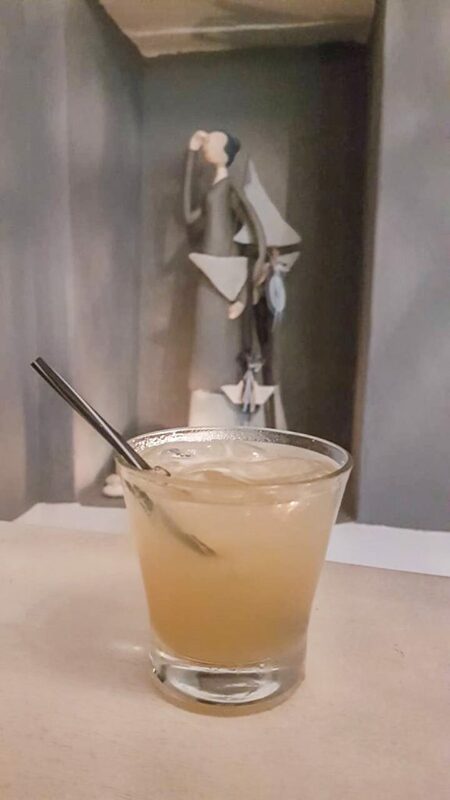 With a few twists on the classics you can enjoy Premium Cocktails such as Cheese Cake made with whiskey, Cherry puree and lemon sorbet or Diplorg Pine — a bled of Diplomatico Exclusive, passion puree, organic pineapple and Falernum syrup. 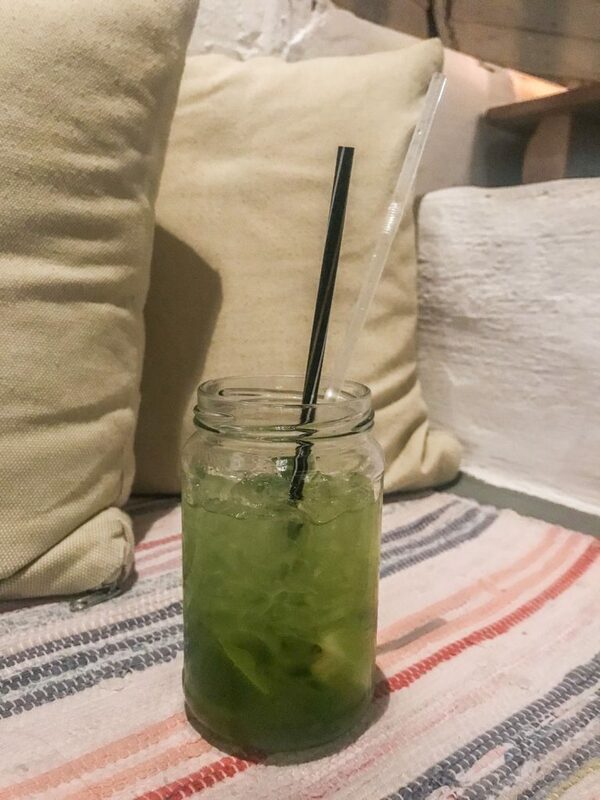 For a refreshing sip try the Cucumber made with Gin and yuzu puree. 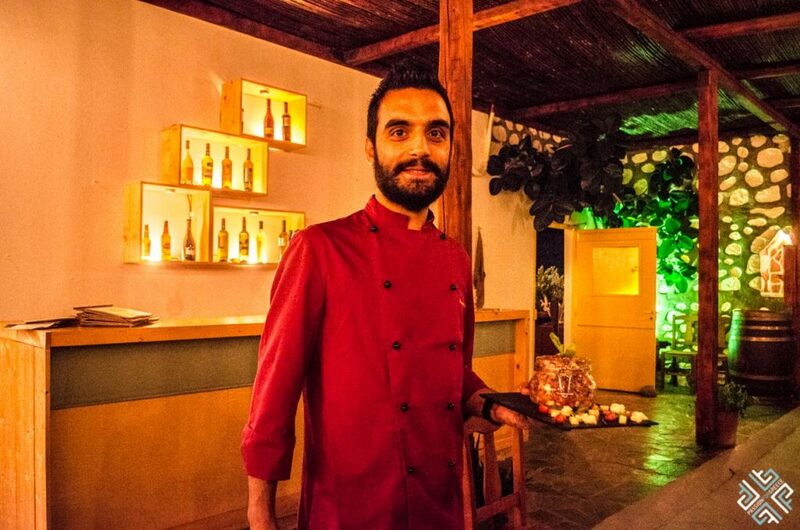 Ask the bartender Panagiotis Vendouris to find your perfect match and enjoy a sweet summer night on Kimolos. 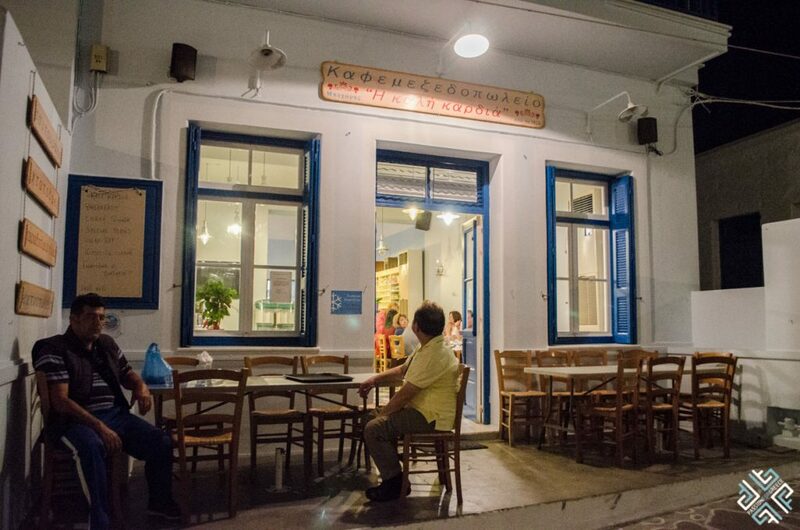 We hope that you find our foodie guide to the best restaurant on Kimolos useful. 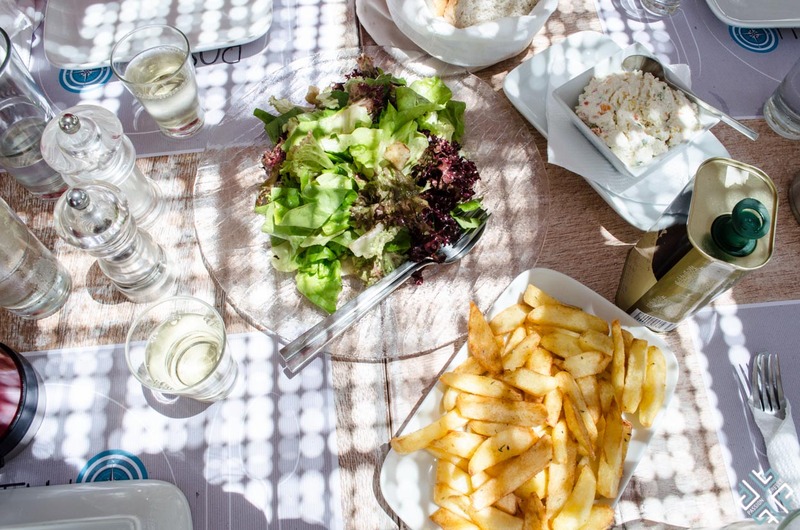 Happy Dining! 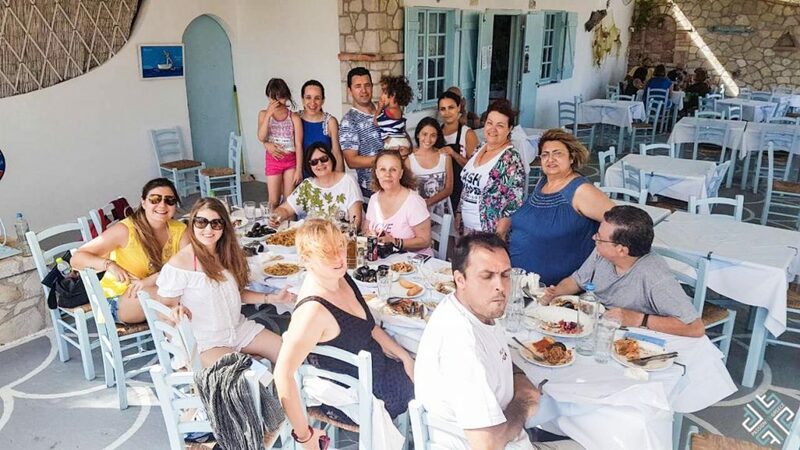 Travel Bloggers Greece were invited on this trip by Afentakeion a non-profit organization which was set up by the Great Benefactor George Oikonomou Afentakis who was born in Kimolos in 1820 with the scope to offer financial support to his birthplace Kimolos and especially to the poor and elderly people of the island. 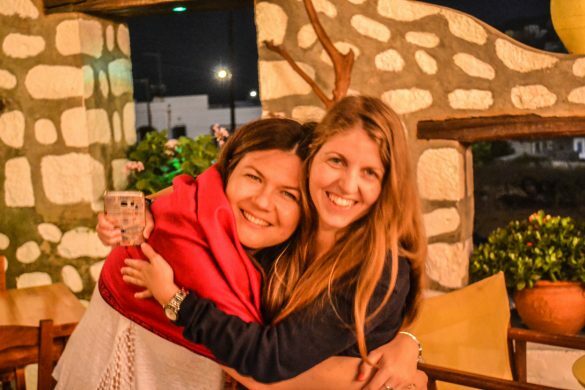 We would like to thank all the people of Kimolos for their generous and heartfelt hospitality and a special thanks to Mania Tsavlidou and Dimitris Papadimitriou for being the best team leaders.